“The Fine Bindery” is dead. 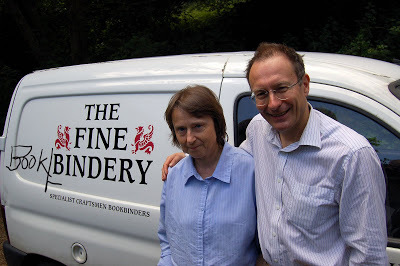 Long live “The Fine Book Bindery”! 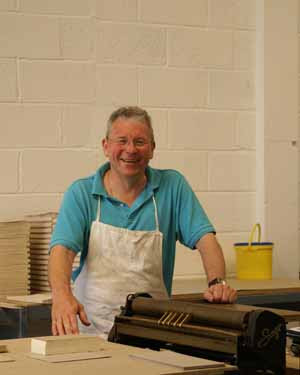 For most of our books, we at The Old Stile Press are responsible for every aspect of their making except for the paper and the binding . . . and sometimes Frances even makes the paper. For very many years the physical aspects of our bindings have been dealt with by our friends at The Fine Bindery at Wellingborough . . . as our colophon pages testify. There will be problems from time to time with any relationship like this but, all in all, the folk there have been wonderful to us . . . responsible for beautifully formed bindings at reasonable cost, imaginative and patient responses to my more wacky ideas and creative suggestions as to how they might be made possible to realize. In recent months we have known there to have been problems but we are thrilled and relieved to hear that a phoenix has risen from the ashes and that, given a following wind, and all the support that can be given them, the slightly renamed ship is again on the high seas with most of its original crew still at their posts . . . eg Kevin! We are happy to say that Black Marigolds was one of the first books to be bound by the new outfit and the new ‘knights in shining armour’, Patrick and Frances (or ‘Hickey’), were kind enough to drive the books over themselves. We do wish them luck. NB. I must reassure you that the jokey graffito you see on the side of the van was added by me with my new tablet rather than for real!